Develop & Design utilizes web development technologies that are both proven and practical. With the options available in the market today, we can help you determine what is best for your needs. Our mission at Develop & Design is to make the web development process easier for you: we help our clients choose the right tools for hosting, ecommerce, content management and marketing. 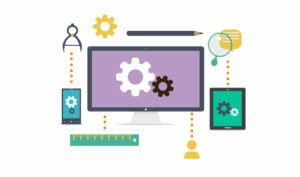 Businesses that need custom Internet applications use our web development solutions. Our in-house web development experts are knowledgeable and well trained in today’s latest web technologies. A Website development project requires detailed planning if it is to be successfully realized. The planning process – exchanging ideas, weighing options, allocating responsibilities – ensures all parties involved in the web project are working towards a common goal. The key to the process is the identification of the Web site’s purpose and target audience. This information informs directly influences decisions on style, structure, and technology. Ultimately the choice of technology used to code a Website depends heavily on the functionality required for the Web site and any possible future development needs of the site. We develop more than websites: Our web development consultation provides solutions to problems and systems that improve how you do business. Our solutions are built for your brand, your goals and your consumers. Making you better and growing your brand takes more than just lines of code; it’s the result of careful and strategic planning and consistently great, user-friendly solutions. After we’ve nailed that, our expert front-end and back-end php development team come together to create elegantly engineered, future friendly, and secure web solutions that not only meet your needs, but exceed them.